The making of cheese dates back more than 4,000 years. Cheese is nutritious food made mostly from the milk of cows but also other mammals, including sheep, goats, buffalo, reindeer, camels and yaks. 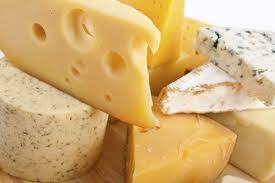 Cheese is a highly popular food worldwide, produced in a variety of forms. It is a rich source of high-quality protein, and may also be very high in fat. In addition, it is an excellent source of several vitamins and minerals, especially calcium. For this reason, it may cut the risk of both heart disease and osteoporosis when eaten in moderate amounts. One thick slice of cheddar cheese (28 g) contains about 6.7 g of protein, which is similar to what you get from a glass of milk. The fat content of cheese is highly variable, depending on the type of cheese. It can range from 1% in cottage cheese to 34% or higher in cream cheese. It is very high in saturated fat (70%), but also provides a fair amount of monounsaturated fat. Cheese contains small amounts of carbohydrates, mainly lactose. Certain types of cheese are not suitable for people who are lactose intolerant.The major carbohydrate in milk is lactose (milk sugar). During cheese production, some of the lactose is broken down into glucose and galactose. However, the extent of lactose breakdown depends on the type of cheese. Moderate consumption of well ripened cheese is usually well tolerated by those with lactose intolerance. It takes 10 pounds of milk to make 1 pound of cheese. Cheese is more than just calcium; it also provides high-quality protein needed to help stay healthy. For those with lactose intolerance, cheese can be an important source of calcium. Natural cheeses such as Cheddar, Colby, Monterey Jack, mozzarella and Swiss contain minimal amounts of lactose, because most of the lactose is removed when the curds are separated from the whey in the cheese making process. According to the Institute of Medicine, those with lactose intolerance can rely on cheese as a source of calcium: “… virtually unrestricted amounts of reduced-fat hard cheeses with very low amounts of lactose may be ingested to ensure adequate intakes of calcium. Mozzarella Cheese. Mozzarella is a fresh, pulled-curd cheese made from the milk of water buffalo or cows. The curds are heated in warm water and stretched by hand before being rolled into moist balls. The balls of cheese can then either be sold fresh, or packed in a salty brine to add flavor. Fresh and dairy rich, mozzarella is prized for its texture and mild creamy flavor. Cheddar cheese originated in the village of Cheddar, England. A firm, cow’s milk cheese that ranges in flavor from mild to sharp and in color from a natural white to pumpkin orange. Canadian cheddars are smoother, creamier, and are known for their balance of flavor and sharpness. Cheddars vary in flavor depending on the length of aging and their origin. Taleggio Cheese. Taleggio is one of the world’s oldest soft cheeses. The washed rind cheese is in a family of cheeses created by monks who made cheese from the milk of their grazing cows in order to eliminate waste. Taleggio smells sort of like… feet. Rich, buttery, meaty, feet. Its soft rind is edible, though it acquires a grainy texture from its repeated wash with salty brine. Asiago cheese is a nutty flavored cheese that hails from Europe. It is named for a region in Italy where it was first produced. Asiago cheese is produced in two forms as follows: fresh Asiago, also known as Pressato, and mature Asiago, which is called Asiago d´Allevo. Fresh Asiago has an off-white color and is milder in flavor than mature asiago. Mature asiago also has a more yellowish color and is somewhat grainy in texture. Blue cheese is a general classification of cow’s milk, sheep’s milk, or goat’s milk cheeses that have had Penicillium cultures added so that the final product is spotted or veined throughout with blue, blue-gray or blue-green mold, and carries a distinct smell. The characteristic flavor of blue cheeses tends to be sharp and a bit salty. Due to this strong flavor and smell, blue cheeses are often considered an acquired taste. Cream cheese is considered to be a fresh type of cheese due to the fact that it is not aged. The flavor is subtle, fresh and sweet, but has a light tangy taste. At room temperature cream cheese spreads easily and has a smooth and creamy texture which makes it rich. Cream cheese is usually white in color and is available in low fat or non fat varieties. Feta cheese is one of the oldest cheeses in the world and is said to be a product from Greece. Feta is soft cheese, and is made from sheep milk if a mixture of sheep and goat milk. More recently cow’s milk has been used. Feta is white in color, is a bit sour to the taste and rich in aroma. Vegetarian cheese is cheese that is not curdled with rennet, which is an enzyme that exists naturally in animal stomachs. Most vegetarian cheeses are coagulated with plants, fungi or bacteria. There are specific plants that also have the enzymes essential to coagulate milk. Plants that have found more common use as coagulants are fig tree bark, thistle and mallow.